Sandits are a new hand tool designed for abrasive applications in tight, hard to reach surfaces. 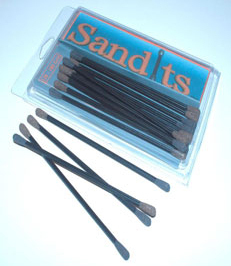 Pack of 10 6" long Sandits with a plastic stem. 120 grit on one end and 180 grit on the other. Gold-plated brass. It is decorated with seed clusters, one of the classical thimble themes. Notably, it is a model intended specifically for the hard-working hands in couture houses.